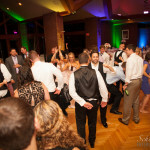 Great friends and great music make for great weddings. 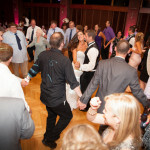 I love that I get to see couples surrounded by their closest friends while dancing and singing to their favorite songs. 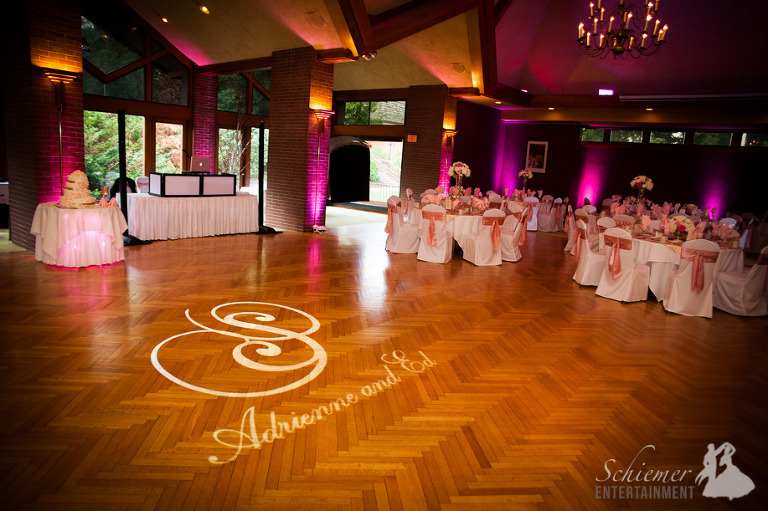 Adrienne and Ed had plenty of both for their elegant and fun reception at the Edgewood Country Club in Chuchill, PA. 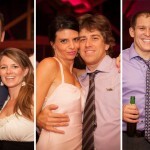 This was an especially fun night for me since I was lucky enough to know a few of the newlyweds’ friends. I had played, or am about to play at their weddings. 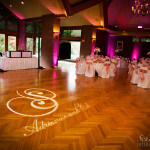 On top of that, I was able provide uplighting and a custom monogram to the already beautiful ballroom. Adrienne and Ed put together a fantastic day for everyone to enjoy. 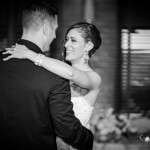 Their attention to detail combined with their relaxed nature made their wedding day absolutely perfect. Now they get to get some time away from it all as they head off for a romantic honeymoon in St. Lucia. Most people have an idea what they want for their wedding, but it can be difficult to have every detail work according to plan. 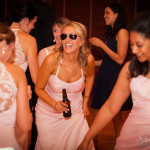 I encourage all of my guests to have the confidence to have things their way, and I love when people are able to create a reception that celebrates the uniqueness of the bride and groom. Yesterday I was thrilled to be the DJ for such an event at the wedding reception of Colleen Daley and Nicholas Elliott held at the Edgewood Country Club in Pittsburgh, PA. 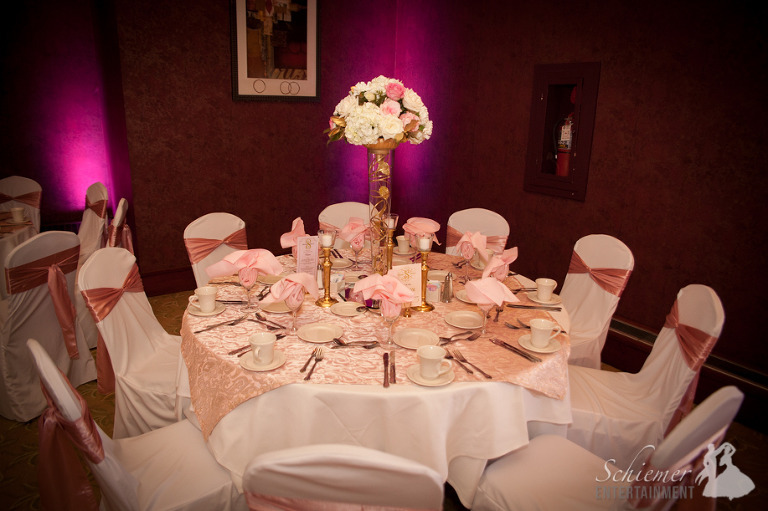 The Country Club was decorated splendidly. 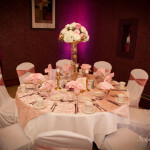 The customized up-lighting really tied everything together, and the room was the perfect size for the approximately 240 guests. Each table was designated with a word from “Pittsburgh-ese”. What a fun way for guests to find their seats! Colleen and Nick had an entrance like none I’ve ever seen. 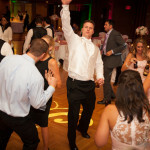 When I announced the couple, they entered with members of the Pitt Drum line followed by the Pitt Panther himself! 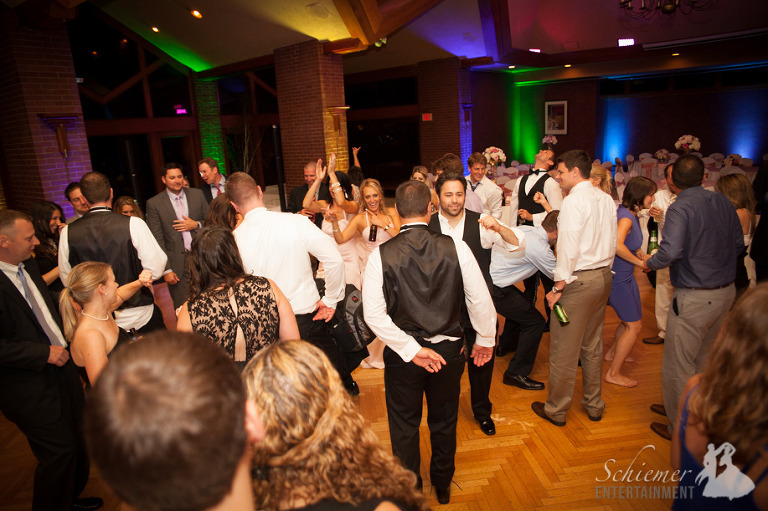 All the guests stayed on their feet dancing and singing along to Neil Diamond’s “Sweet Caroline”. It was AWESOME! Among the other things that Colleen and Nick developed for their big day, they also worked closely with me on a wonderful selection of music to be played throughout the evening. Their choices were spot on, and their friends and family crowded the dance floor all night long. The evening was so well organized that we were even able to do a few festivities between courses. The newlyweds’ first dance was sweet and elegant. I still can’t get over Colleen’s lovely wedding dress. Then things got pretty wild when the dancing started! Later in the evening Colleen changed into a fun reception dress. Perfect for dancing all the way until 1AM! I love helping people achieve the wedding of their dreams. 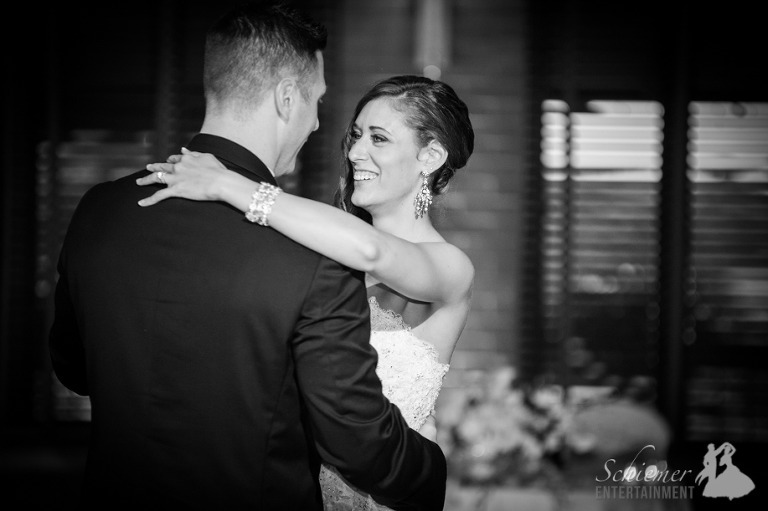 Colleen and Nick had an amazing day and didn’t compromise anything to make it a perfect reflection of who they are. (They actually did so many cool things, I can’t even begin to list them all here!) I’m thrilled they chose me to be a part of such a fabulous celebration. The newlyweds are now off for a 2 week honeymoon in St. Lucia.